Imagined futures: what will rural school leavers being doing in 20 years? What do young people imagine they will be doing in the future and what obstacles lie in their way? These were questions we posed to a total of 84 Form IV students in 3 schools in or very near to A1 resettlement areas across the country, from high potential Mvurwi to medium potential Wonedzo in Masvingo to low potential Chikombedzi, as part of a series of Q sort exercises, a quant-qual technique for extracting ‘viewpoints’ from participants’ sorting of a range of options. Through a series of informal focus group discussions with Form IV school goers living in each area, we came up with a long list of activities that could be imagined as potential future livelihood options for both boys and girls. After much debate, and quite a few changes (some activities combined, others split, some removed, others added), we ended up with 49, with some linked to farming (as different types of farmers, others linked to professional and formal jobs, others in the informal economy, and others focused on reproductive/care work). The basic criterion was that could they imagine themselves in these jobs (astronauts and others were thus excluded), but they included a massive range from maricho piece work to lawyers. Next we turned to the potential constraints to realizing these imagined futures. For this list, we ended up with 36 for sorting. These included macro factors (from climate change to sanctions) to relationships with the state (corruption featured prominently), to personal and family matters (including illness, family disputes and so on) to education/training qualifications, to social relations and connections (via family, church, political parties). Alongside imagined futures as professionals, service providers, self-employed business people and wage workers, engagement with agriculture featured surprisingly prominently, running counter to some of the literature that assumes that young people are just not interested in agriculture and don’t see it as a future. For example, perhaps surprisingly from one of the lowest potential agriculture areas in the country: If you are a farmer you are rich. Growing own food is like growing money (Alpha Mpapa). There are of course particular circumstances pertaining to Zimbabwe, with its depressed economy and opportunities opened up due to land reform, but jobless growth in the context of relative land abundance is not after all completely unusual in Africa. However, the young people didn’t emphasis just any old farming, but they had a clear focus on intensive irrigated agriculture, notably horticulture, but also tobacco in Mvurwi. Both were seen as a route to accumulation and future prosperity. Engagement with farming was also seen in other ways: farm management as a job was emphasized, and farming as a business, with engagement across value chains via markets. Across discussion groups, there was lots of enthusiasm for these trajectory, from both boys and girls. For example, from a Wondedzo report back: Youths do not have land. If they access land they lack inputs to buy agricultural inputs – fertilisers and machinery. Youths are poor and lack funds to carry out farming projects. Gaining access to irrigable land – even initially as very small plots – was seen as essential, combined with a small pump and access to markets. Discussions, for example, emphasized: Youths should be considered for resettlement – especially in irrigation schemes. Bank loans should be extended to youths to engage in farming projects (Wondedzo). Old people were seen to be holding on to land and being wasteful and unproductive. So there is demand for land for youth, but less interest in extensive dryland farming it seems. For example, unproductive land in the hands of old people who cannot use it should be given to youths, and there’s need for dam construction and expansion of irrigation land (Lucknow) They’ve seen their parents fail too often. Drought, climate change and poor soils were mentioned frequently in all sites (it was after all in the midst of an El Nino year). For example, on discussion group at Alpha Mpapa commented: Most young people do not have land. Those with land lack capital to set up farming business. They also lack farming knowledge and skills. Land should be availed to youths. They should have access to agrobank loans. Education was seen as vital all discussion groups concurred. They were after all at school – and getting O level results crucial (they were going to sit in a few months, and there were a few teachers present perhaps influencing the discussion!). 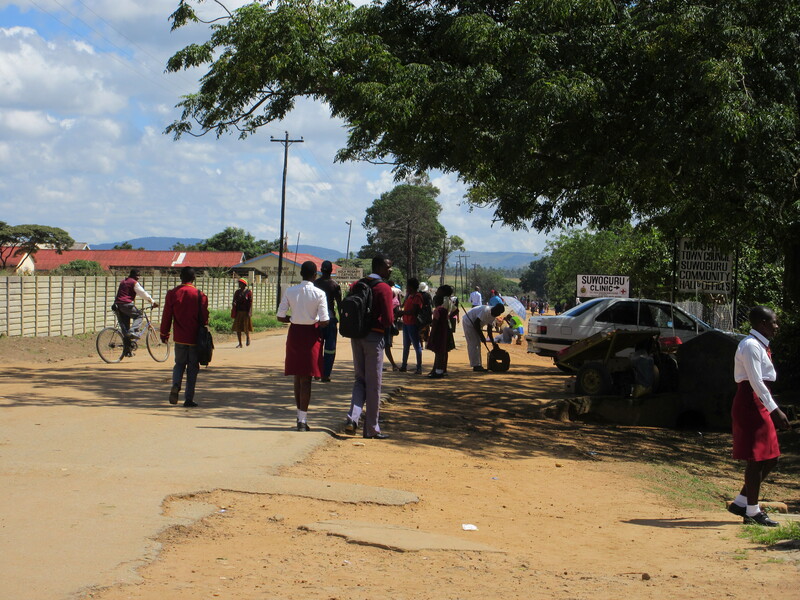 Especially in the two schools in Masvingo province, there was a real sense this is the route to getting a ‘proper job’, while in Mvurwi the focus was on making money through tobacco, in a setting where accumulation from agriculture has been highly successful in recent years. I wonder if the views from Masvingo are perhaps a bit of a throwback to the past, and the influence of parents views, where post-independence education, or colonial mission education before that, really did deliver jobs, whereas now the number of those with O levels in the ranks of the unemployed is huge. In Mvurwi the pattern of early marriages of girls was highlighted. Failure at school, with parents unable to support, and the need to find an independent income, often results in young women marrying older man. While only mentioned in more private conversations, the ‘compound culture’ of the farms was also mentioned. In the former labour compounds, but also seemingly in the nearby A1 areas, there is a pattern of multiple divorces and fragile relationships, bearing heavily on young women, making seeking a secure independent income essential after school. In terms of constraints, many were listed in the discussions. For example, from Lucknow: Farming is hard work, no farming resources, climate change, land degradation, low commodity prices, expensive farm machinery, limited land, deforestation, siltation, soil leaching – soils become infertile. It’s low profile work, no loans for youths, no land for youths, corruption at the market place, poor roads, no capital, few extension workers. There was the continual refrain that there are no jobs (with multiple people to blame, but mostly politicians), and they have all seen their parents, older siblings and others struggle. Many themselves do small jobs, such as piece work, panning etc., and so are well aware of the limited opportunities for accumulation. However, many saw themselves leaving home and trying their luck in the job market, at least while still young, gaining as they saw it the ‘freedom’ to be away from school and parents. Those in Chikombedzi saw the opportunities of South Africa beckoning, despite plenty of experience that it is not always such a land of plenty across the Limpopo. Reports from these discussions demonstrate a mix of naivety, hope, aspiration, but also an impressive realism and groundedness. While some aimed high (I will go to the UK, will become a lawyer etc. ), there was also a realization that farming is a genuine option, if intensified and capitalized (even at a very small scale, with a $200 pump), and that there are many ways of engaging in agriculture beyond tilling the land (marketing, being employed in input supply businesses, farm management, all featured prominently). They know there’s land in the A1 smallholder resettlement areas where they livre, and it could be used better. Ambitions are relatively low – a hectare or less to get going, they will then market the produce, invest in better pumps for irrigation and later by a truck to take produce to market. Just as they’ve seen their parents doing on the A1 resettlement areas. These are the perceptions of school leavers about how they imagine the future, and what constraints they think will impinge on their ambitions, but what actually happened to those slightly older than them, who left school 5-10 years before? Next week I will share some of the results of our youth cohort study from one site from the A1 resettlement areas of Wondedzo, Masvingo.